You will learn over 25 easy to master techniques that are proven to grab your guests’ attention, and earn more tips. You will learn how to present the gourmet cocktails that you have created in a way that will make you more money per round than average bartenders will ever make. These proven techniques are fun and make you look like you’ve been bartending for years! You will learn little tricks that will generate BIG TIPS. 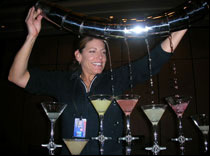 We believe that flair is wasted the minute a guest has to wait for a drink, so you’ll learn proven moneymaking techniques that will NOT slow down your service. This program will teach you how to use flair in a fast-paced bar atmosphere without compromising the quality of your drinks.